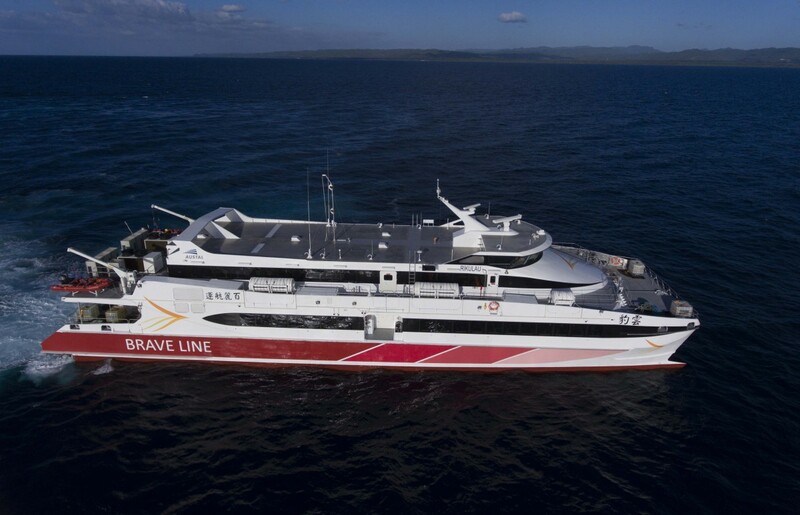 Designed by Austal Australia and constructed by Austal Philippines, the ‘Passenger Express 50’ for Brave Line of Taiwan is a new design, based on a proven catamaran hull form that has seen 57 similar sized vessels (40 to 50 metre LOA) constructed for more than 33 operators worldwide since 1991. The 50 metre high speed aluminium catamarans are capable of carrying 552 passengers (over 2 decks, including a VIP cabin) at up to 39 knots (@ 90% MCR). The vessel is powered by four MTU 16V4000M63L engines and driven by four Rolls Royce KaMeWa 71S4 waterjets. The A$44million contract for two 50 metre catamarans (Hulls 680 and 681) was awarded to Austal in September 2017.